Allevyn Life Foam Wound Dressing from HealthyKin.com is an innovative woundcare product which is easy to use for both clinicians and patients. It has a unique shape that fits the contours of the human body, aiding dressing retention and allowing the patient to feel secure that their dressing will stay in place. Allevyn Life uses materials integrated into the design to provide cushioning and protection from knocks and bumps. A low trauma silicone adhesive provides minimal pain at dressing changes. 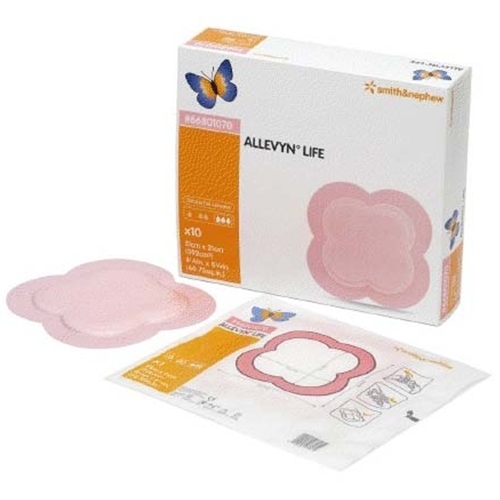 Allevyn Life Dressing uses a hyper-absorbent lock away core to prevent leakage of exudate. A change indicator helps avoid unnecessary dressing changes, reducing wastage. Masking is used to prevent patient embarrassment and stigma caused by exudate being obviously visible through the dressing. Great product and pricing- gentle on skin. Protects and cushions wounds very well. Very good product. Expensive but Healthy Kin had the best price I could find. Great product but a little expensive!